Today's Tuesday Tips and Tricks segment focuses on one of those card finishers, you know, those last little details that really finish off a card and give it a polished look. 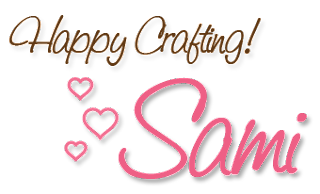 Today, I want to talk to you about stitching! Now with stitching there are A LOT of options, you can hand stitch, use a sewing machine, faux stitch with a marker or pen, or even faux stitch with stamps such as with the SP and Company Stitchery Doo stamp set. My project for today shows you one of the easiest ways to stitch on a project, faux stitch with a pen! When faux stitching, I tend to use either my Copic Multiliner or a white gel pen. Faux stitching is actually really easy once you get the hang of it. You just create a dashed line around whatever you are faux stitching around. As you can see, a white gel pen shows up even on the darkest of colors. 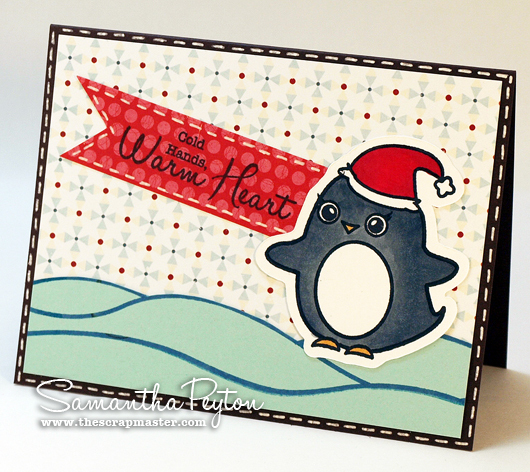 This adorable penguin and sentiment are both from new SP and Company stamp sets that will be available at iCopic.com shortly. I colored the penguin in with the following Copic colors: R29, R27, R46, C7, C5, C3, Y38. Those snow mounds were also made with a stamp, this one is from the Falling Snow stamp set by SP and Company. For additional card details, click here! Positively precious and love the paper!! Fabulously cute sentiment, too! Such a cute little penguin!